In an old farmhouse in the small town of Uitgeest you will find this lovely apartment located in an old restored farmhouse. It is located in the middle of an old village in a quiet street. The apartment has a large living room with open kitchen and dining table for 6 persons. There are two bedrooms. The master bedroom has a queen size bed and a separate bed. The other bedroom has a bunkbed. You will also find a sofa bed in the living room. There is one bathroom and another separate toilet. There is a washing machine and dryer for your own personal use. Outside you'll find a small terrace with dining table and barbecue. Private parking available in front of the door. Close to our home, at about 500 meters is a hughe lake where you can swim, surf, go kayaking, rent a boat etc. You will also find some good restaurants at the lakeside where you can dine al fresco. At about 10 minutes from our home you will find the dunes with wonderful bike and hiking trails (national reserve) and beaches with watersportfacilities (kitesurfing and golfsurfing) and some excellent beach clubs. Amsterdam is easy to reach by car and train within half an hour, Alkmaar and Haarlem are a 15 minute drive. 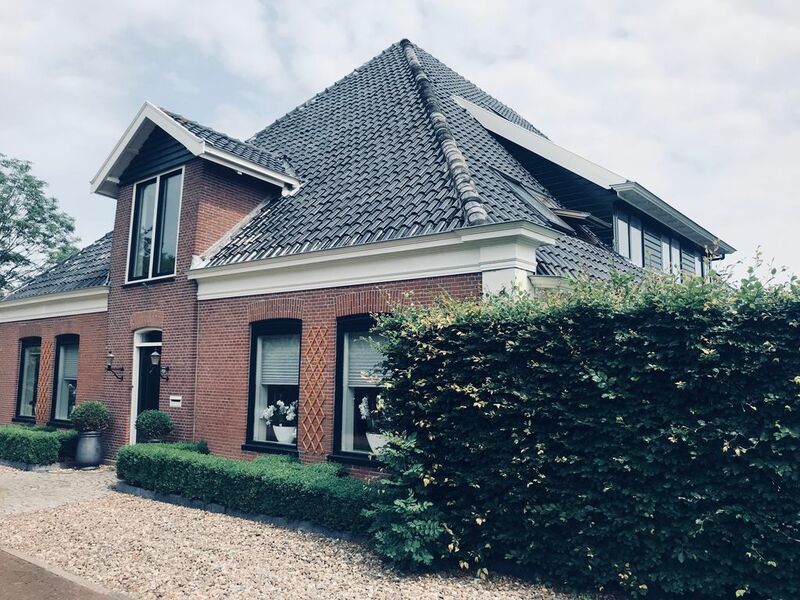 As a family of 5 we have moved from Amsterdam to Uitgeest 16 years ago and renovated and restored this 125 year old farmhouse. We still love the idea of living in a rural town and close to the beach in combination with the 3 most beautiful cities in the Netherlands closeby. The location was important for us, outside of the city yet close and near to the sandy North Holland beaches, Cycling in the dunes national park is a wonderful experience but just as easy of the Haarlem or Alkmaar, two beautiful alternatives to the crowded center of Amsterdam. The apartment is an entirely ground floor and easy accessible. It is located in a quiet street but still in the middle of the village with all shops that you need within walking distance. Nice open air swimming pool(s) with slides in the village. Swimming lake at 500 meters. Jo and Bob were so friendly and helpful! What fabulous hosts! The property was beautiful, comfortable, and clean! We would definitely stay there again. Thank you! Great accommodation, very well equipped and comfortable. Host were fantastic and helpful. I originally booked this farmhouse based on the photos online. Upon arrival, my family and I were blown away! This home is beautiful!!! The decorations, the vibe, the coziness, everything about it was perfect! The bed was the most comfortable bed I have every slept in! Jo, the owner, was extremely nice and welcoming. We are so glad she recommended the Sea and also the town of Alkmaar as those two places turned out to be our absolute favorite from our trip! Thank you again for your amazing hospitality! Everyone needs to stay here when vacationing in Amsterdam, or anywhere in the Netherlands for that matter! We hope to be back one day! Thank you Lisa, you make me blush :).....it was really nice to get to know you and your family. Guests like you are the reason why we want to rent our apartment, it's such a blessing when you can make somebody feel at home in a foreign country! Loved the area, so peaceful and all the locals were friendly and helpful. Beautiful cottage which had everything to cover our needs. Honestly slept like a baby as we were so comfortable! Thank you Jo for such a wonderful stay. Die Vermieter empfingen uns sehr freundlich und erklärten und zeigten uns die schöne Wohnung. Wir hatten tolle Betten, es fehlte an nichts, wir konnten prima für die ganze Familie kochen. Gewürze, Öl, Essig, Frischhaltefolie usw., alles Notwendige ist vorhanden und das in einer tollen Qualität- biologisches Olivenöl, tolle biologisch abbaubare Spül- und Putzmittel und schönes Schampoo. Wir haben uns sehr wohlgefühlt. Vielen Dank Familie van der Lee. Wir haben uns sehr wohlgefühlt!